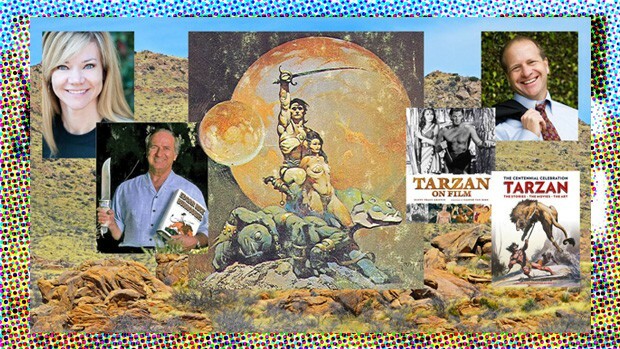 This June at the 2016 Phoenix Comicon the late “great-grandfather of modern pop culture,” author Edgar Rice Burroughs, makes his triumphant return to Arizona, the place where his very first fantasy story, “Under the Moons of Mars,” began. For over 100 years Burroughs’ work has entertained millions of fans and inspired countless authors, artists and science professionals, including Jane Goodall, Carl Sagan, Stan Lee, Frank Frazetta, George Lucas and James Cameron. It’s fair to say that without Burroughs’ influence the pop culture conventions we enjoy today would not even exist. Burroughs’ literary creations include icons like John Carter of Mars and Tarzan of the Apes, one of the most popular and beloved fictional characters of all time; and with the summer blockbuster film, The Legend of Tarzan (starring Margot Robbie, Alexander Skarsgård, Samuel L. Jackson and Christoph Waltz), swinging into theaters July 1st, there’s no better time to learn the storied history behind the Lord of the Jungle and his creator. Join Jim Sullos (President, Edgar Rice Burroughs, Inc.), Scott Tracy Griffin (author, “Tarzan: The Centennial Celebration”, “Tarzan on Film”), artist Terry Beatty, who recently worked on ‘The Lion’ for Dark Horse’s graphic novel adaptation of Jungle Tales of Tarzan, and Cathy Wilbanks (Edgar Rice Burroughs, Inc. Archivist) as they discuss the storied history of Edgar Rice Burroughs’ creations, including Tarzan of the Apes and John Carter of Mars, culminating with Warner Brothers’ upcoming feature film “The Legend of Tarzan!” Moderated by Bob Leeper (Evermore Nevermore/The Arizona Cave). A prize raffle will be held for attendees. Author Ray Bradbury deemed Tarzan creator Edgar Rice Burroughs “the most influential writer of the Twentieth Century, bar none”. Was this accolade deserved? Moderator Bob Leeper (Evermore Nevermore/The Arizona Cave) joins Jim Sullos (President, Edgar Rice Burroughs, Inc.), Scott Tracy Griffin (author, “Tarzan on Film”, “Tarzan: The Centennial Celebration”), comic book legend, Marv Wolfman, who was responsible for the Edgar Rice Burroughs adventures in DC and Marvel comics in the Seventies, comic book veteran and writer Ron Marz, of Dynamite Entertainment’s “John Carter: Warlord of Mars” series, and Cathy Wilbanks (Edgar Rice Burroughs, Inc. Archivist), to trace Burroughs’ influence on modern pop culture from Superman to Star Wars and beyond. A prize raffle will be held for attendees. JAMES J. SULLOS, JR. is the president of Edgar Rice Burroughs, Inc., the entity that owns all copyrights and trademarks related to the works of Edgar Rice Burroughs (1875-1950). Jim assumed his role in May, 2008, having previously been appointed Vice President and a member of the Board of Directors in 1994. Jim served the company as the outside accountant prior to his Board membership. Among the accomplishments of Jim’s tenure are the release of the feature films, Walt Disney’s John Carter (2012) and Warner Bros.’ The Legend of Tarzan (2016), the original Netflix animated television series Tarzan and Jane (Fall, 2016), and the production of new novels, comics, apparel, and merchandise. CATHY WILBANKS joined Edgar Rice Burroughs, Inc. as a warehouse clerk when she was still in high school. In the ensuing years, Cathy’s role has grown more authoritative. She worked closely with Danton Burroughs (the author’s grandson), and was promoted to archivist in 2008 after Danton’s death. Today she assists Jim Sullos in overseeing the many media and print projects licensing Tarzan of the Apes, John Carter of Mars, and the company’s other franchises. SCOTT TRACY GRIFFIN is the author of Tarzan: The Centennial Celebration (Titan Books, 2012), the only authorized illustrated history of Edgar Rice Burroughs’ immortal literary character, and 2013 Locus Award Finalist for Best Art Book. A recognized authority on Burroughs and his creative legacy, Tracy’s career highlights include working as an editorial contributor to film industry magazines, scripting the UFS Tarzan Sunday comic strip, and serving as a consultant and on-camera expert for numerous documentaries and news programs. His second book, Tarzan on Film (Titan Books, 2016), explores the ape man’s century-long cinematic history. Mr. Griffin can be found at Table Number- AA1724 – when not at the ERB panels. RON MARZ has been writing comics for more than two decades and has worked for virtually every major publisher and compiled a long list of credits, including stints on Thor for Marvel, Green Lantern and Superboy for DC, Star Wars and Conan for Dark Horse, and as a staff writer for CrossGen Comics. Among his recent work is his historic run on Witchblade for Top Cow/Image, the Skylanders series for IDW, and John Carter: Warlord of Mars for Dynamite. His website is ronmarz.com, and his Twitter is @ronmarz. MARV WOLFMAN is a writer and a legend in the comic book industry. In addition to his classic work on titles like The Tomb of Dracula (where created the vampire-fighter, Blade), The New Teen Titans , Crisis on Infinite Earths, and Amazing Spider-Man. Mr. Wolfman is also well regarded for his 1970s’ work on DC’s Tarzan, Tarzan Family, and Weird Worlds (which contained John Carter of Mars stories), and for Marvel’s John Carter, Warlord of Mars series. TERRY BEATTY is an award winning artist known for his work on projects as varied as the Rex Morgan M.D. comic strip, Mickey Spillane’s Mike Danger, the Mars Attacks/Popeye crossover comic, and the Batman/Superman: World’s Finest graphic novel. He also contributed his artistic skills to the Dark Horse graphic novel adaptation of Edgar Rice Burroughs’ short-story, ‘The Lion,’ part of their recent Jungle Tales of Tarzan compilation. Terry’s website is at: terrybeatty.com. 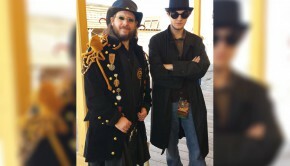 BOB LEEPER (moderator) writes for Arizona’s original “geek” blog, Nerdvana, and is the co-creator of the local pop culture events like ENCREDICON and Steampunk Street. He’s also the co-founder of Arizona’s Pop Culture and Alternative Arts Network, Evermore Nevermore, and he is the curator of “The Arizona Cave,” an Edgar Rice Burroughs fan site that focuses on the renowned author’s connections to Arizona.